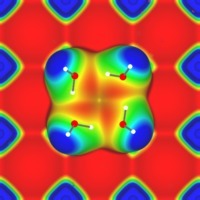 "Exploring novel chemical and physical properties of atomic-scale structures on surfaces." 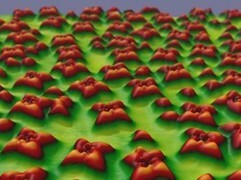 Mobility of ionic hydrates : paper in Nature about mobility of ionic hydrates studied by high-resolution AFM. We studied chemical transformation of 9‐azidophenanthrene on the Ag(111) surface in UHV conditions by nc‐AFM. High‐resolution imaging supported by first‐principle calculations revealed the structure of the final products that originated from a common and elusive 9‐phenanthryl nitrenoid intermediate chemisorbed on the Ag(111) surface. Angew. Chem. Int. Ed. 58 1 - 7 (2019). Nat. Commun. 9 2831(1) - 2831(9) (2018) . We presented a new method to achieve submolecular resolution of weakly bound water clusters on solid surfaces, including their chiral orientation or metastable configurations. This significantly advances the current possibilities of imaging weakly bound water nanostructures using Atomic Force Microscopy. For example it opens a new way to determine mobility of ionic sodium hydrates on surface. Nature 557 701 - 705 (2018). Nat. Commun. 9 122(1) - 122(7) (2018). For first time, we demonstrated a strong piezoelectric response of a single helicene based molecule deposited on metallic surface. 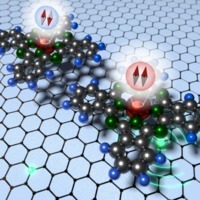 This represents a breakthrough in understanding the electromechanical behaviour of individual molecules and provides a new concept of the design of molecular motors, sensors and electricity generators at nanoscale. J. Am. Chem. Soc. 140 940 - 946 (2018). 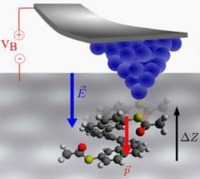 We show for the first time the possibility to reach indirectly through a chemical on-surface reaction the enantiofacial adsorption of flat prochiral molecules on an achiral metal surface, affording highly enantioenriched adsorbates. Naturally, such a spontaneous global mirror-symmetry breaking upon direct adsorption of prochiral molecules on surfaces was not possible so far. Nat. Chem. 9 213 - 218 (2017). Nanosurf group combines experimental and theoretical tools to explore novel material properties of nanostructures artificially built on surfaces. We use ultra-high vacuum low-temperature scanning probe microscopy to investigate their physical and chemical properties at the atomic scale. The experimental activities are supported by theoretical analysis including development of homebuilt tools (SPM probe particle code, local orbital DFT Fireball code). Our main goal is preparation of low-dimensional molecular nanostructures searching for new physical and chemical phenomena at the atomic scale.